Our range of products include acrylic catering buffet counter and acrylic catering counter for restaurants. We are one of the widely acclaimed manufacturers and suppliers of Acrylic Catering Counter for Restaurants. The offered Acrylic Catering Counter for Restaurants is very useful for displaying and presenting the food items. 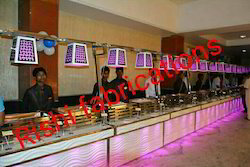 Our supplied acrylic catering counter for restaurants is commonly used in restaurants. The offered Acrylic Catering Counter for Restaurants is a stable framework which is available at very affordable market price.